Professional traders know the power contained within the Commitment of Traders Report. They understand that price trends are created, maintained and stopped by big commercial interests and large institutions. This of course means that they need to follow the "big money" by interpreting the COT data and investing accordingly. A great place to check (free) COT reports and find out what the Commercials, Hedge Funds and small traders are doing is at http://cotbase.com. Steve Briese mentions that the best indication for a trend change is when there is a large divergence between the Commercials (Big Business) and the Large Speculators (Hedge Funds) as shown on the chart below for the Euro on 16 January 2015. For the Commercials to be winners in the pricing war, they need the Euro to appreciate in value from this point forward. With the upcoming European Central Bank Announcement later today the 22 January 2015, we shall see if their economic analysis has been correct? 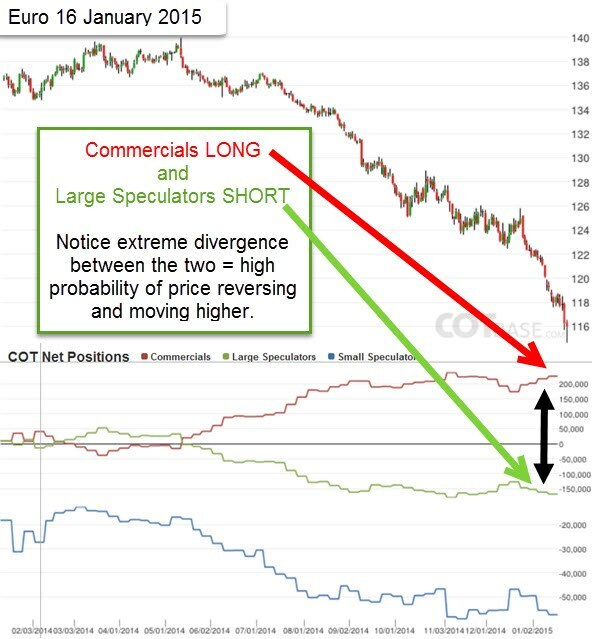 (They say at market highs and lows, the Commercials get it right "most of the time" and the Large and Small Speculators get it wrong "most of the time"). How smart are the Commercials? Notice how Commitment of Traders data could have helped with the recent 15 January 2015 Swiss Bank Announcement? The smart Commercial interests figured the Swiss Franc needed to appreciate in value and the Swiss National Bank (SNB) could not prevent it from eventually happening. Read more here.